The thumbsUp! 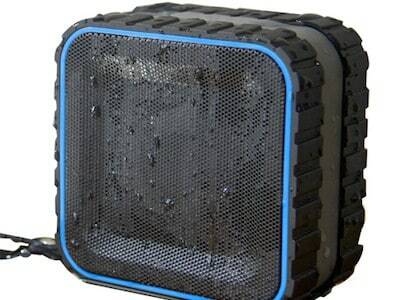 Bluetooth Splash Speaker is a great piece of kit. I’ve been singing along in the shower with this bad-boy for days now, playing my favourite tracks without fear of any stressful splash attack! My personal recommendation for the perfect shower tune for ultimate vibes, you ask? It’s gotta be Pixies’ ‘Gigantic’, but that’s just me. Anyhoo, this speaker has near-faultless sound, and it’ll mean that you’re able to properly rock out while washing the ol’ unmentionables – indeed, the whole showering and cleansing process becomes a much more enjoyable experience overall – that sounded much less weird in my head! The beastly and mega-tough rubber exterior and splash-resistant shell means that it’s easy to operate outside by the pool, or in light rain, as well as indoors in’t shower (no, it’s probably not gonna survive if you chuck it in the pool or directly under a tap). What’s also pretty cool, is that the wireless signal works from up to 10 meters away, so you can experience monster bass (and clear treble) from a good distance via your phone or tablet – have a little naked dance downstairs before the shower perhaps?! 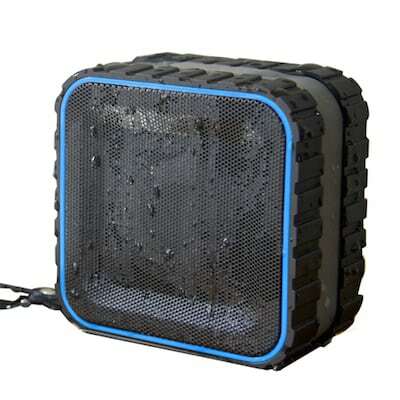 When answering calls in the water, the result is clear, and if you’re on a rough bit of road out ‘n’ about, this thing will take a lickin’ and keep on tickin’ in terms of sound quality and connectivity – we like long trips out in the Yorkshire countryside, see? In terms of accessibility, there’s a rubber lanyard that makes it easy to hang in the shower, on a door or even in the car (yeah, we’ve gone mobile with it too…), and the thumbsUp! has a rechargable in-built battery which provides the user with up to four hours of music for one recharge. That’s just lovely. To summarise then, there’s absolutely no need to compromise with this wet-tech wonderment – if you’re a music fan and you like to keep clean – and if you’re reading this then you probably should be a music fan (and we here at Soundsphere magazine HQ definitely endorse personal cleanliness) then this is the speaker for you. Thumbs…up! Oh, come on. I had to, didn’t I?